A superb buggy, just feels like you have taken your car to the golf course. Full weather enclosure available! see upgrades. As the saying goes, 2 is company. 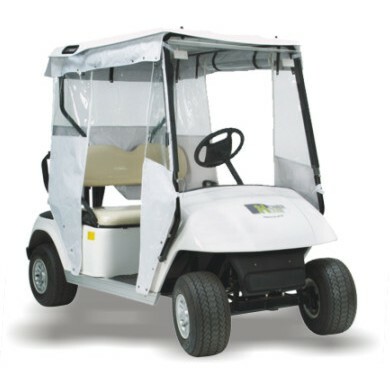 And with the Powerhouse Duo Golf Buggy, you will have everything required to effortlessly carry two adults, two golf bags and associated equipment around the Golf course. At your disposal, is a very capable machine. The transmission powers the rear wheels, virtually silently through a none maintenance Differential gearbox. This is in turn powered by an impressive 2.2kw motor and 6 x 8v, 162ah Ultra deep cycle "Trojan" battery set. Speed and overall control is governed by a 48V Curtis management system. In short, the Duo buggy will travel at 15mph maximum speed for a distance, in the region of 25 miles, with two people aboard. The rack and pinion steering is light and precise, and braking is uncomplicated. using a combined pedal with anti roll brake.